Rural Arts are based in Thirsk in the town’s former Courthouse and Magistrate’s House which was renovated, making a bright creative centre for the area. As well as the activties hosted at The Courthouse, it is also used as a base for a range of workshops and events which are taken out into the community across North Yorkshire. 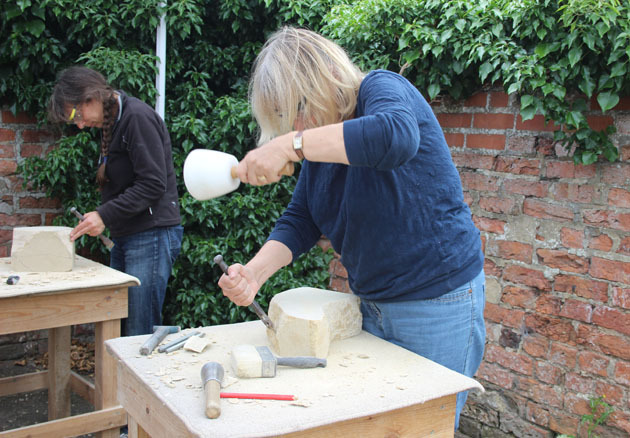 Rural Arts invited me to run a stone carving workshop for them – so on Friday I bundled all my workbenches, tools and gazebo’s (rain was forecast!) together and set off for Thirsk. 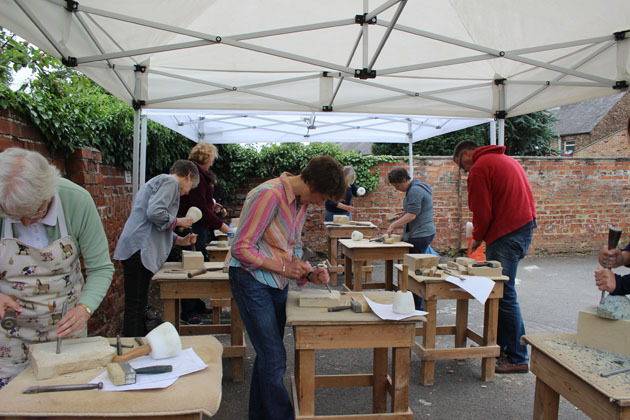 The workshop was fully booked, so I had nine eager first-time carvers to look after. 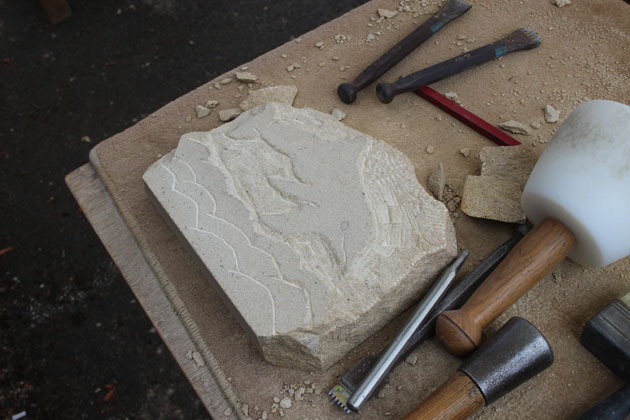 I have huge admiration for the hard work that everyone put in, I know that there were some tired arms, but carving went on and beautiful stone sculptures emerged. It did rain, but I don’t think anyone noticed! 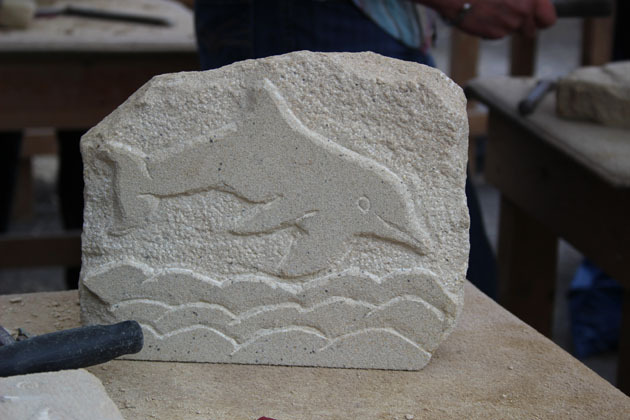 This is the start of a relief carving of a dolphin riding the waves – the image was first drawn on the stone and then the stone taken away around the image, leaving the dolphin standing out from the stone. Progress of the dolphin and work beginning on the waves. We decided that the background should be chiselled in some way to make the smooth image stand out. 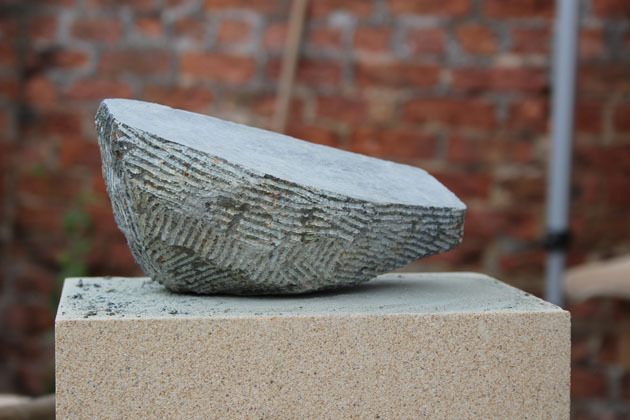 This bobbly texture is known as ‘sparrow-pecking’ and is achieved by repeated tapping of the stone surface with the point of a chisel. 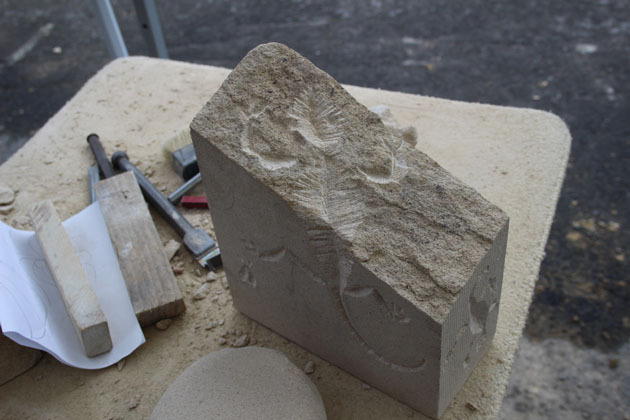 This is another relief carving, showing the beginning stage – you can see the line drawn on the side, which is a guide to show how far back to take the background stone. 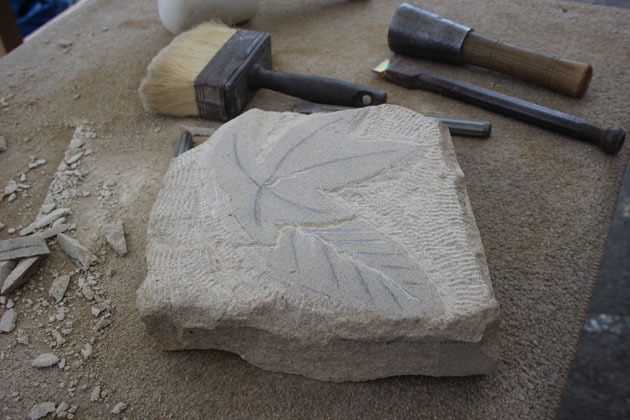 Progress of the leaf carving. 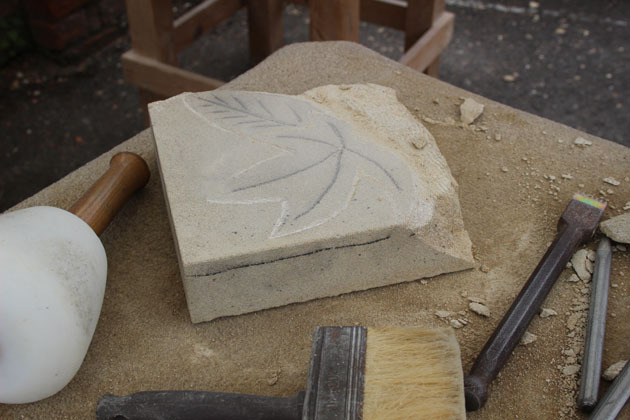 Finishing touches – some lovely detail went into these leaves, making one look as if it was behind the other and the leaf veins carved in too. Perhaps the shape of this stone in part inspired the carving that followed. A spiraling groove runs around the column with unfurling and twisting leaves at the top. 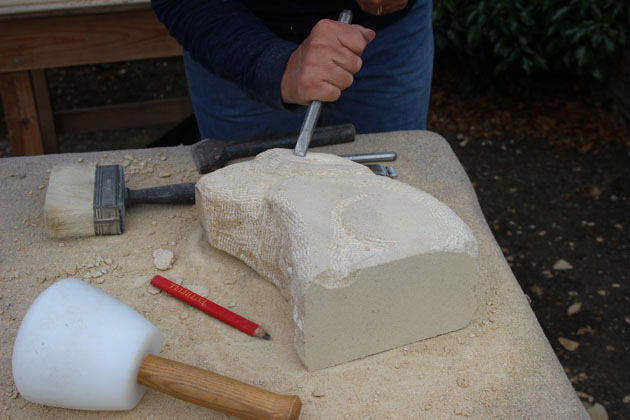 I’m really intrigued by this way of carving – put the chisel to the stone and see where it goes, and what it does – without having a specific plan. It is a beautifully free and creative (and I think brave) way of working. Carving didn’t stop (or only did when I occasionally interrupted to ask if everything was okay, or give a little carving tip or two). It just flowed in flourishes and experiment. Seeing what marks the different chisels made doing different things with them. Dots, dashes, curves, deep carving, surface mark making, shapes and hollows. 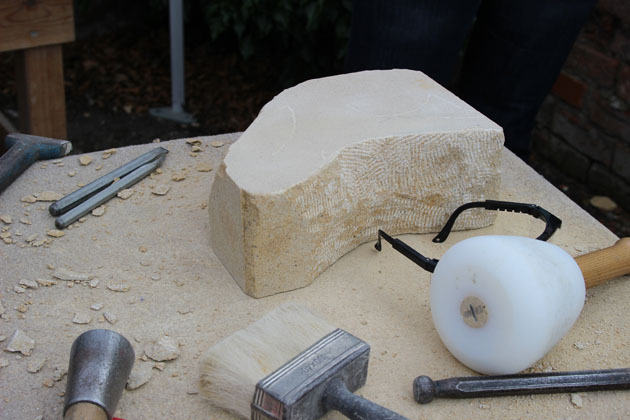 There were a number of different types of stone for the carvers to choose from, and this is a very fine grained, almost chalky limestone which is a lovely stone for beginners as it is soft and forgiving. This piece was perhaps the most ambitious and perhaps most completely ‘in the round’ (three dimensional) of all the carvings. It was also chiselled with great precision and neatness, all the lines were true and tidy. 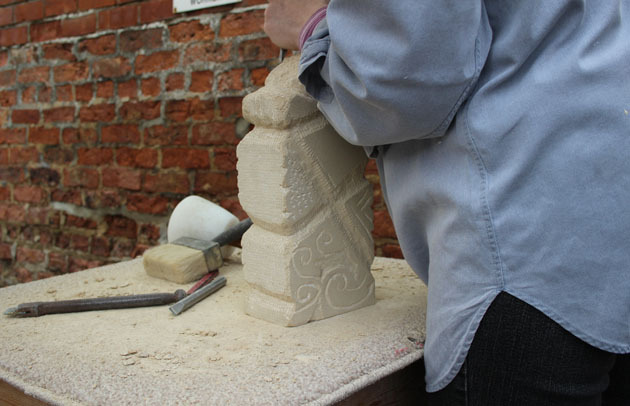 This way of carving, of working on a profile of the shape required, first taken from the side, then the end and then the top elevation, is very different from the previous way of working. It makes a rather blocky, square version of the final sculpture. Then corners are rounded and the shape refined. 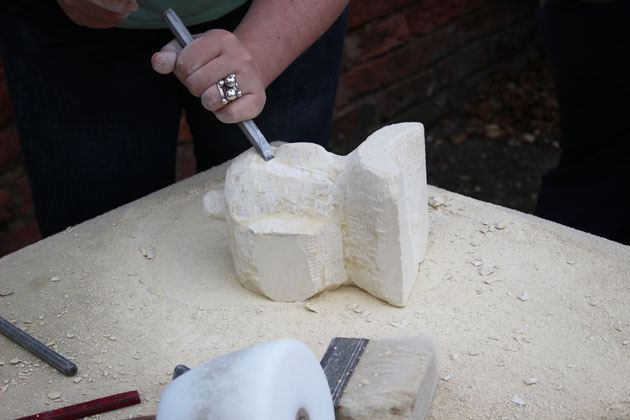 When you first begin carving this is not easy to do – it was followed through in this carving with lovely attention to detail and though the piece didn’t quite get finished on the day, everything was in the right place for this characterful sculpture to be completed. Sometimes carvers bring with them a images, or models to inspire their carvings. This little ceramic rabbit (made by Elizabeth Bailey) is perfect for making in stone, all compact with arcing curves, and full of personality. 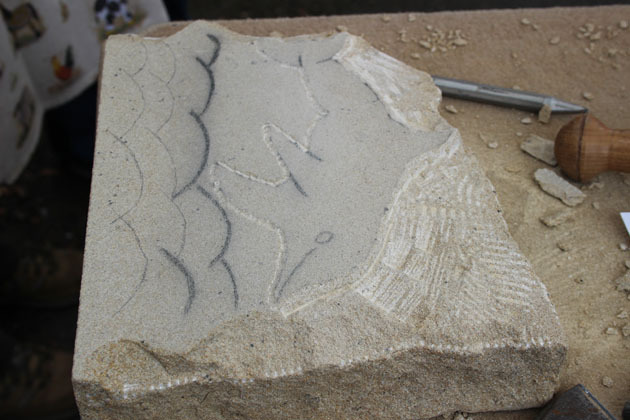 The carving began by drawing the outline on the stone and then taking away the stone not required. You can see the egg shaped curves beginning to appear. Often the simplest shapes are, in the end, the most difficult to achieve. Small discrepancies do show up – but the rabbit sculpture steadily took form. 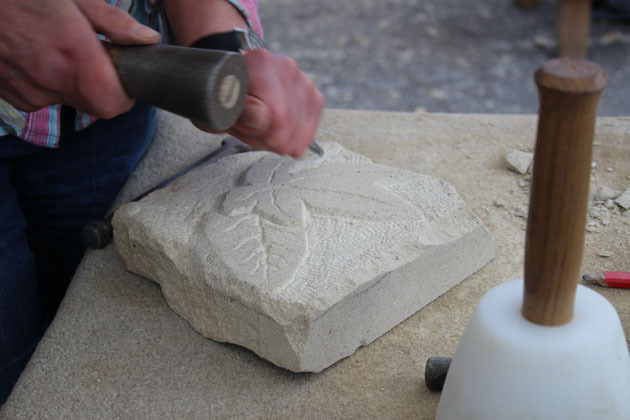 Stone carving is quite a lot about steady progress, determined steady progress, which needs deep concentration. 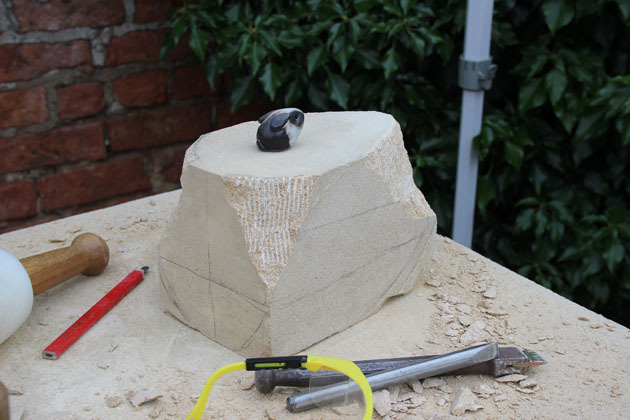 I do encourage lots of drawing on the stone as carvings progress – I think it helps see where you’re going and you can tell if something is going to look right or not, before taking stone away (which cannot be put back!). The square stone becomes rabbit, through carving in curves. 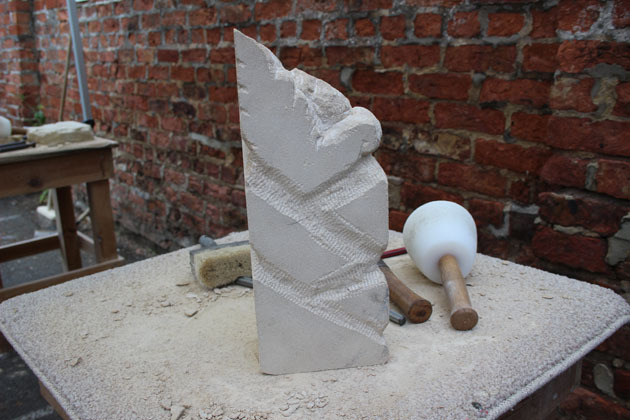 At times you put the chisel down and stand back for a moment, to understand where next to remove stone – concentrate, look at the model, draw in the line, and dare to chisel away. It can feel daring at times, especially when you’re getting close to the finished sculpture -rabbit went nervy at times, but as you see, became confident and shapely. The same process was used for the hare sculpture. 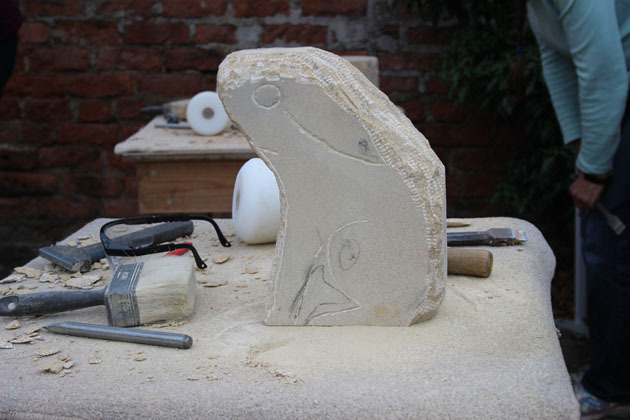 Initially the outline of the hare is carved. 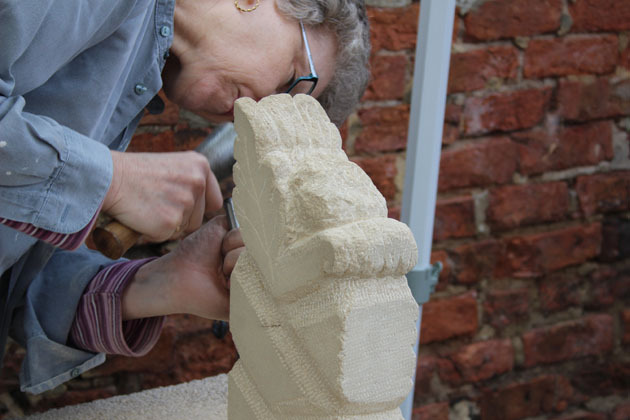 Shaping and details begin to be carved in, and all of a sudden the sculpture takes on a life of its own. 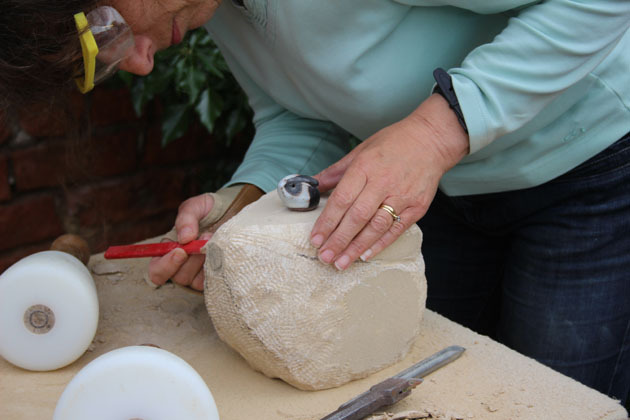 It is at this point when it can become difficult to take the sculpture to the next stage – marks you have made or shapes carved, you don’t want to lose and you become suddenly less confident with the chisel. Hare had a nervy spell too – but recovered magnificently and there was a frenzy of carving, hollowing out ears, rounding the chest and slimming down limbs. Sometimes it is just taking a leap of faith! 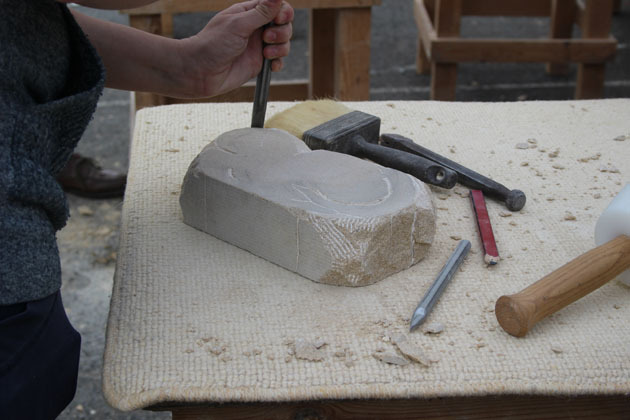 This stone started as a relief carving, so initially lines were carved into the top surface. The idea was, if time allowed, to carve more three-dimensionally. This curled cat purred all the way through. A few strong incised lines made the outline of head and tail wrapped around the body, paws neatly curled underneath. With very few marks this carving came to life, confidence grew and more smoothing, rounding, shaping was done. 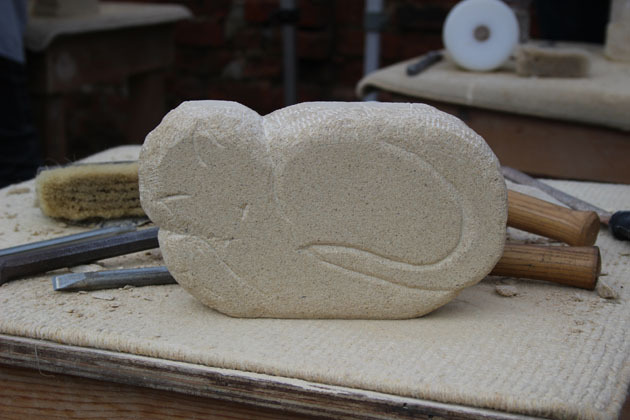 Lots of times carving stopped and curled cat was viewed, close, from a distance, sideways, from above and below – so that a rythm and feeling could be shaped into the stone as a whole. Great care was taken in the finishing too – getting a smooth curve for the tail and making subtle transitions from one feature to the next. Snoozing Cat (my title) – what a delight. One of my carvers selected a soapstone piece to work, and a particular stone was selected for its shape, which suited the idea for carving. 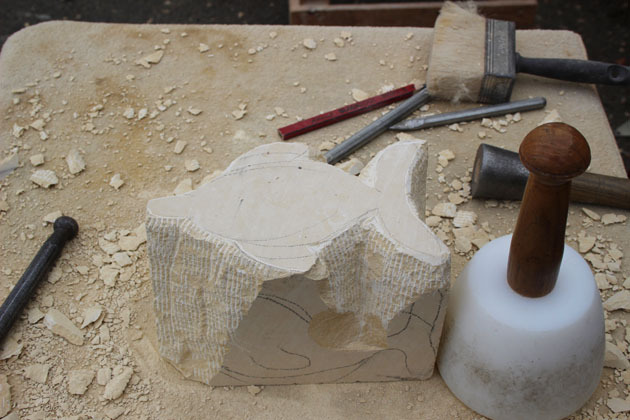 The carving started with an idea to make a shape similar to some of Barbara Hepworth sculptures. 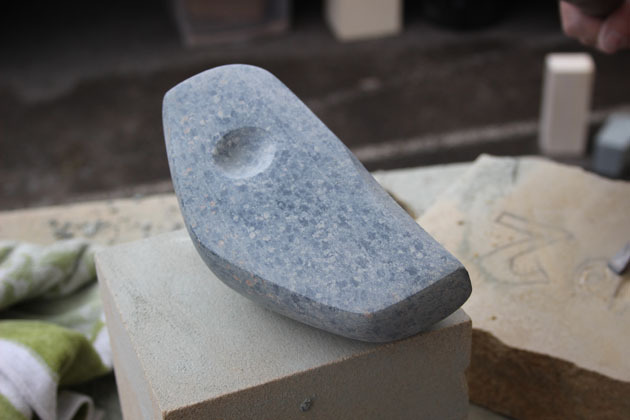 Though soapstone is fairly easy to carve, it does require a lot of finishing and sanding to get a smooth, polished surface. Lots of work with the file, and sandpaper, using progressively finer grades is necessary and it suits this type of abstract shape really well. The carving became smoother and smoother, with all the edges crisp and sharp, in contrast to the circular dimple, creating a refined balance. It became very beautiful to hold in the hands – a piece to love and have close. A lizard crawls over the surface of the stone – the rough part of the stone is as it is riven from the quarry, and the other sides are sawn. 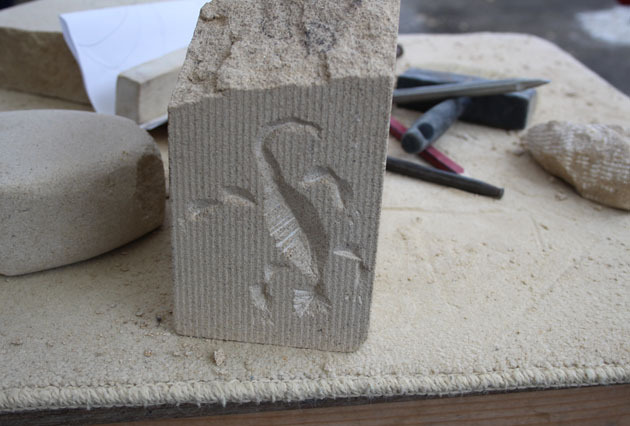 This way of carving follows the principles of letter-cutting, in making a ‘V’ section groove, but in this instance is widened and narrowed to create the lizard body and legs. 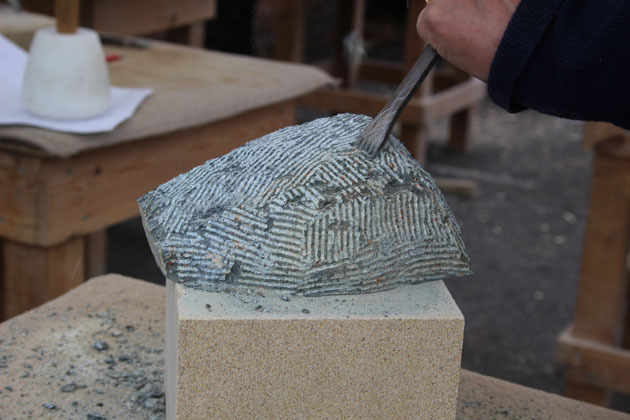 As the groove is created the chisel leaves marks as it is tapped by the mallet, and the lines have been left to give great effect to the wider sections of the lizard. A smaller lizard appeared on another face of the stone, and the finished sculpture featured insects too – flies for the lizards to feed on. Each and every carver had such a different approach and way of working, which in turn created finished pieces with great individuality. Perhaps the stone carvings reveal a little something of their makers – in fact I’m sure so! A very inspiring day, for me anyway, and I hope it was for my carvers.